My family loves spinach & artichoke dip. Every time we go out to dinner, if the restaurant has it, they order it. In my opinion they all skimp on the artichoke. Probably a way to keep production cost down. Well, my family deserves better than skimpy dip. There are many different versions of Spinach & Artichoke dip available. I searched high and low for the perfect dip but couldn't settle on one......so I made my own recipe. Why not, right? It was a HUGE hit in my house. Instead of keeping it all to myself, I thought I would share it with you all. After all, everyone deserves good dip. It is perfect for Sunday football or just game night with the kids. I picked up some Halloween colored chips at the store......they just went perfect with the dip and made it look all Halloween-ish. Mix all ingredients together in a bowl or stand mixer except artichokes. After everything is throughly mixed, fold in artichokes being careful not to break them up a lot. spray a baking pan with non-stick cooking spray. Spoon dip into the greased baking dish. Bake 30-40 minutes or until bubbling and the center is hot. Serve with a side of chips. 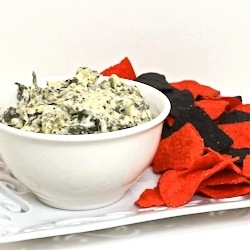 My hubby and I love love spinach and artichoke dip but this recipe looked better than any of the others I found. I gave it a try two weeks ago and have made it two more times since!! It's wonderful - this will be a regular for us!! Yummy! We are a crazy dippin' household! lol - seriously, we have dip at least two times per week so I was delighted to find your recipe and will be making it this week!